To make recycling plastic personal, just think about how much plastic is in your home right now. In the kitchen, bedrooms, garage, and living room - we use a lot of plastic. The good news is that most plastic is recyclable, although some forms are easier than others. 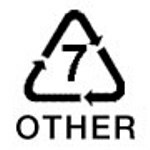 The plastics industry, in an effort to help with recycling plastic has developed a system of numbers or recycling symbols to identify the different types of plastic, which relates to how they can be reused. The number is stamped on the bottom of the container. Understanding the numbering system is the key to effective plastic recycling. There is a tremendous amount of plastic that ends up in the landfills simply because it was not sorted correctly. 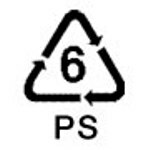 So, on to the numbers - let's look at the recycling plastic symbols. 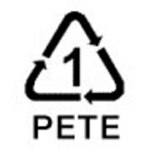 Number 1 - PETE (Polyethylene terephthalate). These are the easiest and most common plastics to recycle. Soda bottles, water bottles, and many other household containers fall into this category. PETE plastics can go on to enjoy a second life as filling for coats or sleeping bags, bean bags, car bumpers, or as another bottle. 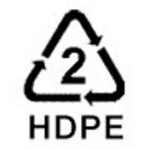 Number 2 - HDPE (High Density Polyethylene). This is another plastic that is easy to recycle and is accepted at most recycling centers. This is a heavier duty plastic, commonly used for milk containers, juice bottles, laundry detergent, and nursery plant containers. This plastic can come back as toys, plastic pipe, or rope. 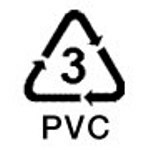 Number 3 - PVC (Polyvinyl chloride). PVC has gotten a bit of a bad reputation because it is more difficult to recycle. It is used primarily for long term applications such as water pipe, plastic dashboards, and other long term uses. Because it is used primarily for long term applications, there tends to be a relatively small amount of household waste made of PVC. Although from a technical standpoint, it is relatively easy to reprocess PVC, most centers do not accept #3 PVC. 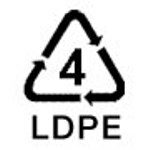 Number 4 - LDPE (Low-Density Polyethylene). This is the stuff of plastic grocery bags, and sandwich bags. This is another form of plastic that is not accepted by many centers - but fortunately most supermarkets now have plastic bag recycling at their stores so it is easy to drop them off during your shopping trip. 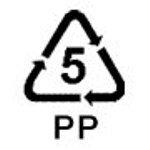 Number 5 - PP (Polypropylene). Tupperware containers, butter tubs, and many other household packaging fall into this category. This is another type of plastic that is not often accepted at recycling centers. Fortunately, Preserve Products has established drop off points at most Whole Foods Markets for the recycling of #5 plastic. This is the most common of the "Hard to recycle" plastics, but we now have a great way to give #5 a second life. Number 6 - PS (Polystyrene, Styrofoam). This type of plastic is usually easy to spot - coffee cups, plastic cutlery, trays, packing peanuts. It is easy to reprocess, often into sheet insulation. Some centers will accept #6, others won't, but you can usually find one that does. Number 7 - Other. This is the catch all category for all other types of plastic, often a combination of types. These are seldom recycled, so the best course of action is to simply avoid purchasing products in them! The first two, numbers 1 and 2, are the most common household plastics, and also the present easiest way for recycling plastic. Just eliminating these 2 categories will make a huge difference in the amount of trash you send to the landfill each week. You will also be surprised how much material you have that will now get a second chance to become something of value! This is what green living is really about - being good stewards and taking care of everything we have.